For those who have never been inside a Robot crane, this is what the driver sees. Robot crane driver’s operate up to 5 or more cranes. 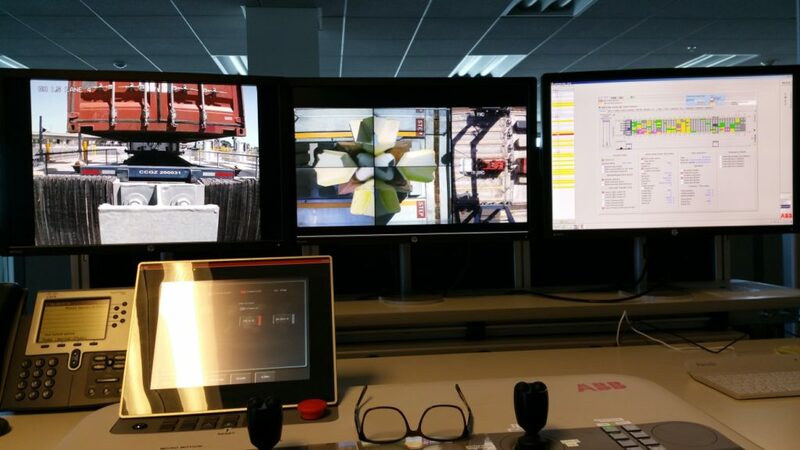 As soon as the load lands, the screen changes to another crane in the que. Yesterday at 4:20 PM, Local 13 called for an emergency Executive Board meeting to discuss the Maersk robot operation. Local 13 has known for over 1 year, that Maersk was switching over to a robot dock but did not feel the need to share that information. Ask Victor Hudak, x-Secretary/Treasurer he has been telling his buddies all about it. Local 13 has also refused to share the robot operation manning reduction agreements with their membership. Step up and share with your members. Also, just so you know LBCT has been using 9.43 Steadymen for the last year. LBCT’s steady crane drivers are shifted to hammerhead or transtainer or rail, just like Local 10’s 9.43 Steadymen. « Jarod Faker goes to trial for unlawful deregistration of B-man & PMA is being charged with colluding with the Union.